Verken Dallas in stijl op een 2 uur durende Segway-tour langs historische bezienswaardigheden en andere belangrijke bezienswaardigheden in de binnenstad. Reis comfortabel op de Segway nadat uw gids eenvoudig te volgen instructies geeft over de werking ervan. Je bezoekt monumenten zoals Pioneer Plaza, het John F. Kennedy Memorial en Dealey Plaza en passeert het Dallas Arts District, waarbij je meer grond in diepte door Segway bedwingt dan tijdens een wandel- of bustour. This is a relaxed and easy way to see the sights of Dallas. 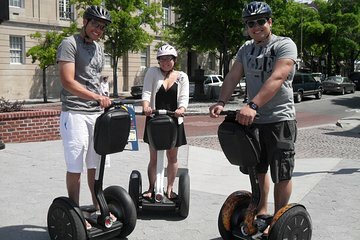 It is easy paced and the segways are easy to use. We covered the commercial district and historical sites including the JFK memorial. we also went into the Arts district where all the museums were located. This tour was so fun! Our guide was knowledgeable and friendly! Awesome experience! Looking for something our 16 year olds would love - and they LOVED this!! Tour guide was very knowledgeable and fun. Two hours went by very quickly - definitely would recommend this tour!! Very fun and informative about some of the history of downtown Dallas! We had a GREAT time!! The tour guide was very patient and encouraging funny too with the initial training. We will definitely do this again!! My husband and I did the 1 hr tour for something different to do while in Dallas. We loved it! Our guide was fun and very knowledgeable about the downtown area and Dallas history. He was great at keeping us together and safe in 5:00 traffic. We highly recommend doing this! It was a lot of fun!! It was the best money I ever spent! We had an hour and half tour with Rachelwho obviously loves what she does and loves Dallas! The price was very fair and such a great value. historical points was amazing.. We seriously cannot wait to do it again!